Our excavation services carry a tradition of highly trained professionals dedicated to teamwork, integrity and performance. As a leading provider of excavation services, we take pride in offering the highest quality service there is. We’re dedicated to satisfying your needs each and every day. With a combined experience of over 35 years, our specialized knowledge and background is applied to each and every job. Each job is centered around our customer’s goals while working within their budget. This ensures that every customer will receive the most value for their investment. We are proud members of the Capital Region Builders Association and Saratoga Builders Association. Proudly serving the Saratoga, Clifton Park, and Glens Falls areas, contact us today to get your project started! Perfection Excavation is a locally owned and operated commercial, municipal, and residential excavating contractor. 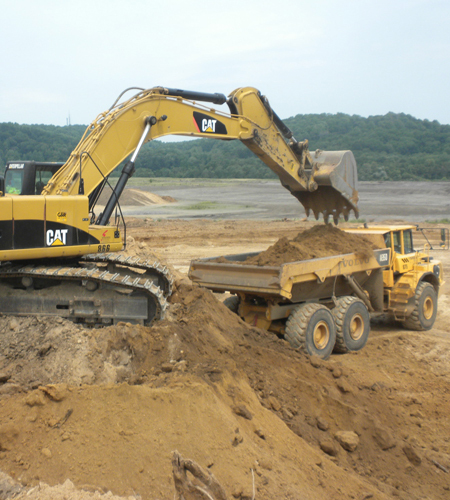 At Perfection Excavation we are equipped with various sizes of equipment to meet the demands of all earth moving jobs. Years of experience as both owners and operators give us the knowledge to complete all phases of your project. Think of us as your contractor and project partner. Our philosophy is not to take every job that comes our way, but to seek out projects where our unique level of expertise and experience allow us to deliver on-time and on-budget. Our capabilities are easily scaled for each project. We can be as big or little as our clients need us to be. Site Preparation includes construction engineering, excavation, leveling, installation of underground utilities, drainage systems, access roads and paving. Perfection Excavation, Inc. also excavates building pads, digs concrete footings, and prepares ground for concrete slabs. Underground Utilities includes pipeline installation for water and sewage systems including all trenching, pipe procurement, installation and final surface reclamation. In addition Perfection Excavation, Inc. also excavates joint trenches for telecommunications, and power lines and septic systems. Road Construction includes all phases of your roads from initial clearing and grubbing to final asphalt paving. Perfection Excavation, Inc. is equipped with a large fleet of equipment that contains but not limited to dozers, excavators, and scrapers. We are outfitted to construct various road types from driveways to roadways. Trucking Services. Perfection Excavation, Inc. contains a fleet of 7 trucks. A modern fleet of large capacity trucks allows us to get the maximum yardage of material to the job, while minimizing the amount of loads. We take great pride in completing each job in a timely manner, while consistently exceeding customer expectations in the commercial, residential, and agricultural sectors. We manage all aspect of projects from conception to completion, creating a seamless process for our clients. Perfection Excavation’s controlled growth, consistent innovation and commitment to excellence allow us to grow our client list each year, one project at a time. Our team of professionals provide exceptional service and individualized attention to each and every job. A proven record of excellence in designing and managing several building and construction projects in Upstate, NY. No matter the size of your project, our experienced professionals will plan, design, construct, and maintain your project. © Copyright Perfection Excavation. All rights reserved.